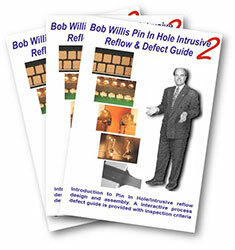 This CD ROM is fully interactive and covers the use of through hole components, design and process requirement when implementing Pin in Hole/Intrusive assembly. Examples of satisfactory solder standards are provided with a complete guide to possible process defects with intrusive reflow. The defect section may be viewed with small examples to make searching easy and then each sample may be viewed at both half and full screen. A description of each of the defects is included with the examples. A full animation of the surface mount assembly process is included on the disk which includes the BGA, double sided assembly and through hole/Intrusive reflow assembly. This section features a commentary by Bob Willis or can be viewed with just a text guide. This CD-ROM complements the video tape, report and photo album already available in industry and are the first products available in the world to cover the use of this technology.